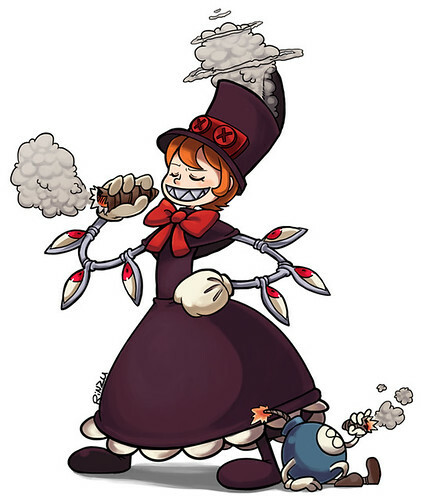 Peacock smokes like a chimney in this awesome piece by Rinzu. This is only the first frame of a short comic strip by A-Bad-Idea – be sure to click through to see the whole thing! Mrs. Victoria’s got her work cut out for her in this piece by Matias. I love the style of this sleek painting by UponThouFairCat. In this beautiful AND thought-provoking piece by Nubbas, Double relaxes with a cup of… herself? Enlisting players would be easy with ads like these. Thanks, Robaato! Have caffeine at the ready, for Filia’s (and Reverge’s) battle has only just begun! Thanks, Shoji-Ikari! Lanimal out-memes the memers. Begin your search and replaces… now! Contractors and recent Whiteboard Contributor Yeppeo drew us another piece of fan art! …More impressive still is this custom Parasoul figure Yeppeo made for Alex as a gift! 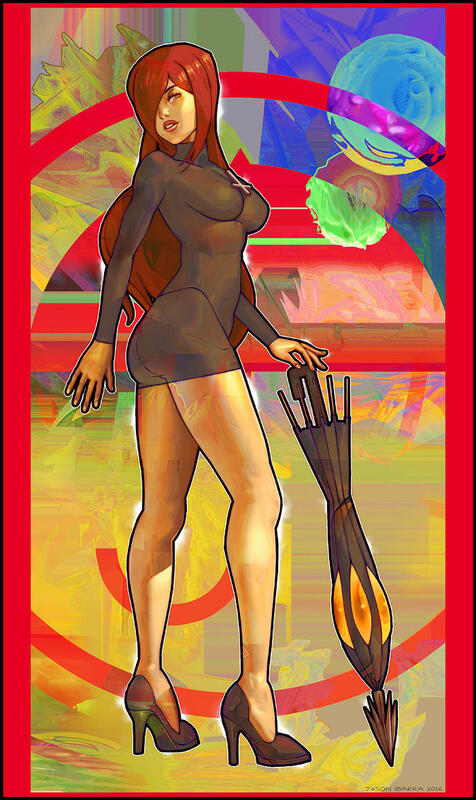 LuMaGa sent over this stylish Filia portrait! Cerebella wields her flowchart to devastating effect in this piece by RandomArtist! This week’s party shot comes courtesy of Sprite37! 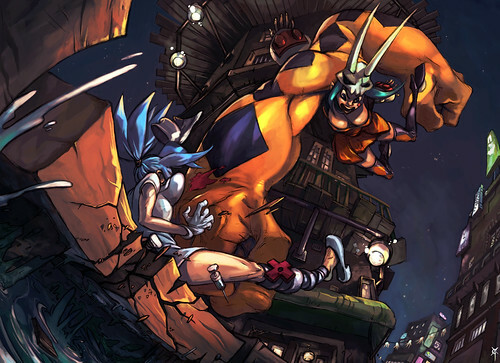 Ha ha ha, I love how Ms Fortune’s just chowing down as she plays. That’s awesome. Wow. Of all the wonderful Fanart Fridays we’ve had, this is my favorite thus far! Seriously, I want to comment on almost all the pictures individually. I probably will, actually, when I have more time to spare at leisure. 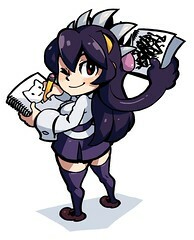 I must say, though… Sprite37′s and Shoji-Ikari’s renditions of Filia seem much too, er… well, too plump for my liking. I mean yes, Filia’s “Likes” include Milkshakes and a nice meal, and she definitely has quite a copious figure, but I insist that she’s not fat. These are, with due respect to the artists, a tidbit insulting to me, fan of the little girl that I am. While they are a tad bit thicker looking then say Alex Ahad draws them I don’t think its too odd outside their style and they hardly look fat to me. I think thats a bit of a stretch to call them that. I don’t think it was at all meant to be insulting to the character Filia either. They are fair representations of the character to me. 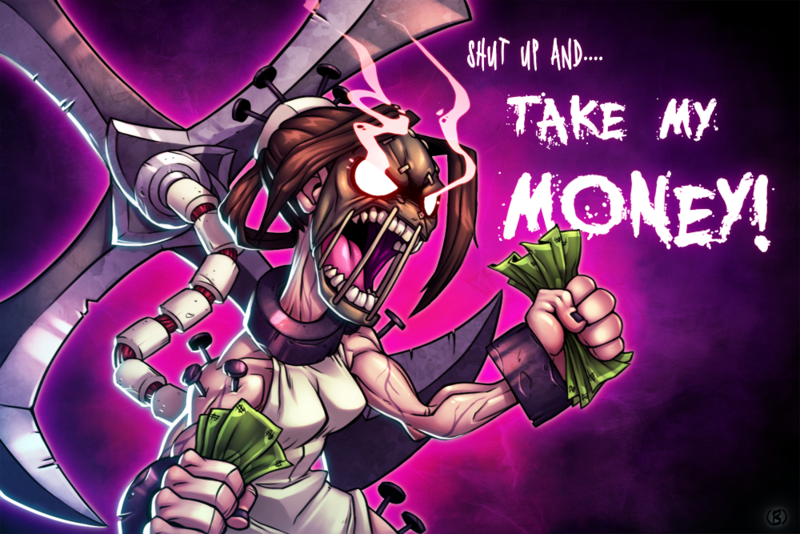 I’m loving Skullgirls right now. Can’t wait for more content (game, OST, avatars, etc.). Thanks again everyone! My favorites would have the ones by UponThouFairCat, Robaato and RandomArtist. I just read about the possibility of Skullgirls figures. If these are like statues of the characters. You can bet I’ll buy them. I’d love to own statues of Cerebella, Valentine, and Ms. Fortune. They’re my team! And now its time for something spectacular!! !